Your friends and family will love these timeless Scripture greetings from The Navigators. Add additional sets for only $10 each! At this holy season and through the year, may God quiet you with His peace, comfort you with His presence and bless you with His love. Joy to the world, the Lord is come!Let earth receive her King;Let every heart prepare Him roomAnd heaven and nature sing. Joy to the earth, the Savior reigns!Let men their songs employ,While fields and floods, rocks, hills, and plainsRepeat the sounding joy. No more let sins and sorrows growNor thorns infest the ground;He comes to make His blessings flowFar as the curse is found. He rules the world with truth and graceAnd makes the nations proveThe glories of His righteousnessAnd wonders of His love. In the late 1600s, most worship music in Europe consisted of singing the Old Testament Psalms. Isaac Watts loved the Bible, yet he thought these songs felt "unnatural" to sing. After one Sunday service, 15-year-old Isaac complained about "the atrocious worship." A deacon challenged him with, "Give us something better, young man." He went home and penned his first hymn, and the love of hymn-writing stuck with him all his life. Later in life, and inspired by the last half of Psalm 98, Watts penned the beloved Christmas carol Joy to the World. Watts transformed the old Jewish psalm of praise for historic deliverance, into a song of rejoicing for the salvation of God that began when the Jesus came "to make his blessing flow far as the curse is found." The music is by an unknown composer using fragments from George Frederick Handel, some scholars say it resembles Handel's greatest work, Messiah. Celebrating the glorious birth of Jesus and wishing you a Christmas filled with His goodness. The Three Kings, or Magi, are mentioned only in the Gospel of Matthew. Few details are given, and most of our ideas about them come from tradition or speculation. Scripture doesn't say how many wise men there were; it is generally assumed three, since they brought three gifts. The Three Kings recognized Jesus Christ as the Messiah while he was still a child, and traveled thousands of miles to worship him. With determination, they followed a star which led them to Jesus. By this time, Jesus was a child, not an infant, implying they arrived a year or more after his birth. Their gifts symbolize Christ's identity and mission: gold for a king, incense for God, and myrrh, used to anoint the dead. God honored the wise men by warning them in a dream to go home by another route and not to report back to King Herod. 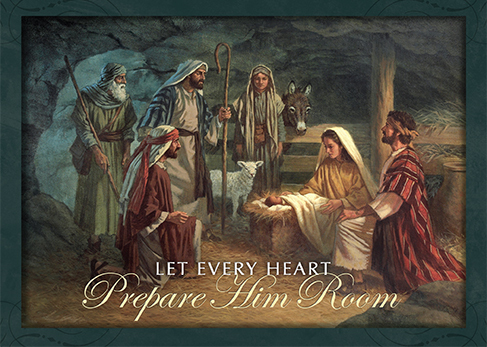 Christmas is a time to reflect and rejoice in the birth of Jesus - God's gracious gift! Wishing You a Blessed Christmas! When you order His Delight! greeting cards, you help touch lives around the world with the gospel through the ministry of The Navigators®. The Navigators is an international, interdenominational Christian ministry that helps people grow in Jesus Christ as they navigate through life. Your gift today will make an incredible difference — supporting Christian discipleship ministry to struggling moms and dads, military personnel, college students, and new believers worldwide. A portion of your gift is tax-deductible! All text and images © 2018 The Navigators.